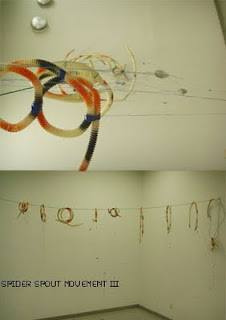 Zee Kraaszie Aorte Blog of Nicola Morton: Spyder Spout Movements I, II & 3 (Graphical Score) - made for Ptarmigan residency. 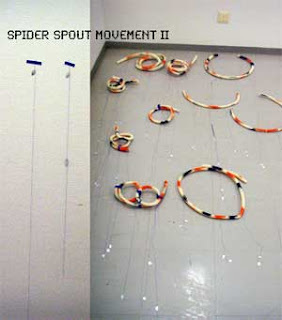 Spyder Spout Movements I, II & 3 (Graphical Score) - made for Ptarmigan residency. 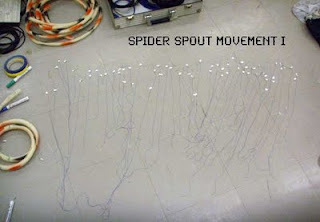 I made a graphicl score in the studio at ptarmigan for my spiders... out of glitter leaves hanging from threads and collecting dust on the floor, then they rearrange each other and move around. The final movement is in the video which I will post when people collected the horns and played them around and untangled and tangled each other. sticky.